This hardy perennial derives from the way the game was played in private gardens in the mid-Victorian period, when there were conflicting sets of rules and hitting one’s opponent into the shrubbery was seen as fair play. Cheating in one form or another was often condoned and even encouraged, a state of affairs satirised by Lewis Carroll in his description of the game in Alice in Wonderland. Croquet today is no more “vicious” than snooker. The continuing association of the word “posh” with croquet is the fault of the media, who persist in portraying croquet as an English upper-class whimsy in spite of the fact that the game moved on from this early phase about a century ago. It has become a sine qua non that croquet must not be taken seriously, as to do so would undermine the media’s use of it as a cultural icon in their obsession with class. John Prescott (Old Labour) was vilified for daring to play the game, and when David Cameron (New Conservative) opened a croquet club in his constituency it is alleged that an aide advised him not to be photographed holding a mallet as it would be “bad for his image”. Enough said. T his tactic was abolished in 1870. Players may use their foot to position the ball for the croquet stroke to save themselves from having to bend down and position it by hand, but you cannot keep your foot on the ball when you play the stroke. You get another shot after the croquet stroke, so the whole point of the croquet stroke is to move both the balls into better positions so you can continue with your turn. This is true of golf croquet but has not been true of Association croquet since 1920. The fact that people still believe it is due to confusion in the public mind between Association and golf croquet and the persistence of outdated rules in games played outside clubs, where players are often unaware of the rules in use today and have to rely on the word of their host or hostess, who may be quoting what they vaguely remember hearing from their grandparents. 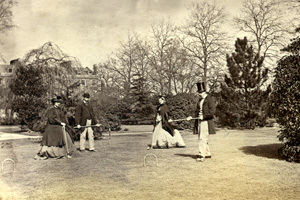 Garden croquet in the 1860s. Note the size of the hoops and the ball destined for the shrubbery.